For clarity, Icarus FC does advertise with our site. It just so happens they keep making the freshest kits! If you are not living in the Philadelphia area, you would be forgiven for thinking Lone Star FC was a Texan club. However, anyone in and around Philadelphia could tell you that Philadelphia Lone Star FC is an absolute institution in the city. The club was founded as Junior Lone Star FC in 2001 by Liberian immigrants, whose heritage is drawn on as inspiration for the “Lone Star” name referencing the lone star on the Liberian flag. The club has come to be known as one of the foremost professional development clubs on the east coast, growing from a single squad when it was founded to a club that fields teams in the NPSL’s Keystone Conference and the UPSL’s Northeast Conference. They’ve provided Philadelphia’s amateur footballers, and in particular those of African descent and heritage, with countless opportunities for further development in the sport. This connection to Philadelphia fueled the club’s desire to rebrand last year and they adopted the name Philadelphia Lone Star. The club adopted a new crest to go along with its new name, ditching a “Barcelona”-shaped badge in favor of a cleaner pointed shield. The crest is not only a slick design, but it also does a simple design in a way that does not feel overly generic or unimaginative. The Liberty Bell is a simple homage to the city these players now call home but the club has not abandoned its own history in the process. Based on the badge above, it would have been fairly simple for Icarus to look at this as a straightforward project. Red, white, blue...there’s 10000 high school, college, amateur, and professional soccer teams (not to mention the National Teams) in the US that use the same color scheme. Lone Star getting the template treatment that we see so often in major club and international football would have been simple. Icarus did not take that route whatsoever as they produced four fantastically unique kits. The impressive thing about this home kit is that it feels both familiar and unique all in one effortless stroke. Wearing sky blue with white shorts could have been a chance to look like a Manchester City copycat, but the Liberty Bells down the sleeves and sides of the shorts evoke a Philadelphia version of the classic Kappa designs from Serie A. The red trim pops in a way that you might not expect against the light blue, while the sublimated Star design makes it so Philadelphia Lone Star is embodied throughout the kit. An impressive effort from top to bottom. The Away Kit is another stunning effort. The red-over-red with the sublimated stars ties this design back to the home kit but it is the pattern on the sleeves and down the shorts that is the true star of the show here. We have seen, especially with Nike’s recent templates, the effort to make different colored sleeves the unique element of a kit. Icarus has taken that idea and cranked the creativity through the roof, implementing a pattern inspired by West African fabric patterns to create something truly splendid. Philadelphia Lone Star’s Third Kit serves the dual function of being gorgeous and aiding a worthy cause. 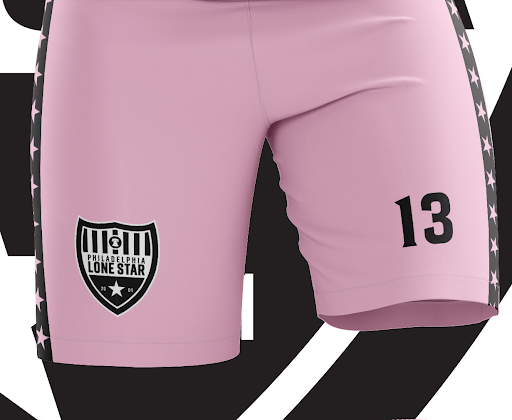 During the middle of the NPSL season, Lone Star will wear this kit in conjunction with a campaign to raise money for juvenile cancer research. Such a campaign should succeed on its own merits, but this design is a fantastic advertisement. The pink and black color scheme has an extremely modern feel to it without it feeling garish. The black and white version of the crest is, quite frankly, badass. The star details down the sleeves and shorts add a nice touch, but the sublimated design again steals the show, with a lovely hoop design culminating near the collar in the Philadelphia skyline. A kit that accomplishes this much both aesthetically and in helping those in need is extremely admirable and I hope this kit gets the attention it deserves. There is something so striking about a well-executed white kit. When that kit has a sublimated spotted print and a unique pattern down the sleeves, you have something special on your hands. The aforementioned pattern extends from the collar, down the sleeves, and down the shorts, with the numbers on the kit itself containing the pattern as well. This kit again brings Lone Stars African roots to the forefront. This celebration of the club’s heritage is evident in each design but this particular design feels like a celebration in and of itself. I, for one, am extremely here for it. This kit will act as a fourth kit for the NPSL squad and will serve as the UPSL squad’s home kit. This may be premature, but I would shortlist this kit for one of the best in UPSL for the Spring Season. Philadelphia Lone Star FC are embarking on a new chapter of their history in 2019 and with this new identity that links their current home to the club’s African heritage, the club is emphasizing what we all love and idealize about the United States and the game of soccer: The opportunity to succeed no matter your background. This club is admirable for its ideals and history, and now we can all look on and admire the kits as well.